Care Bangladesh is a well known organization in Bangladesh. Care Bangladesh has been publishes recruitment circular. Care has offered a job opportunity as an Administrative Officer, Technical Manager. 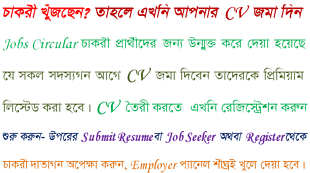 Buro Bangladesh has published a job circular for the posts are Branch Manager, Branch Accountants, Assistant Branch Accountants, Programmer Coordinator, Assistant Programmer Coordinator and others. Buro Bangladesh is a non government organization. Care Bangladesh is inviting from interested and qualified candidates for this post. It is a very popular Non Government Organization (NGO). Care has been working in Bangladesh for 60 years. Improve the lives of the world's largest international humanitarian organization CARE and alleviate poverty, and are committed to helping families in poor communities. The Village Education Resource Center (VERC) is a well known non-governmental organization in Bangladesh. Recently they has been published a circular for the post of Assistant Coordinator, Field Supervisor. They have given handsome salary for these posts. Bishwo Shasitto kendro has published a circular to fill-up vacancy with experienced and qualified people for the following post: Assistant Librarian, Store Officer, Program Officer, Accounts Officer, Vehicle & Logistic Officer, Monitoring Officer, Deputy Director (Vehicle & Logistics), Deputy Director (Monitoring).